GIS largely operates behind the scenes, daily coordinating and orienting our world. Like the 14 previous GIS Day celebrations, the 15th GIS Day celebration on November 19, 2014, gave educators and GIS professionals the opportunity to proudly lift the curtain on Esri technology and show it to a new audience. The day also serves another equally important purpose: to ignite the imagination of future geospatial innovators who'll move the world forward. Attendance was strong at the University of Idaho's GIS Day event, with student, faculty, and local GIS professionals from across the state participating in the day's events. Participants had the opportunity to attend presentations on everything from GIS assisting evapotranspiration investigation to GIS complementing unmanned aerial vehicle (UAV) technology. Other popular sessions included discussions of GIS career opportunities and geospatial initiatives rolled out across the state. The exhibit session bustled with activity for the better part of two hours. "Our goal was to show the audience how we're all geospatially connected," said Bruce Godfrey, GIS librarian at the University of Idaho. 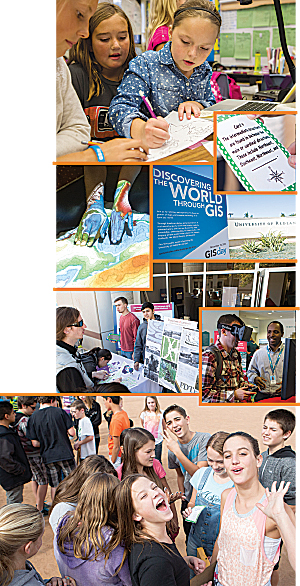 "We had 15 different exhibit tables to demonstrate the variety of ways GIS impacts our lives." 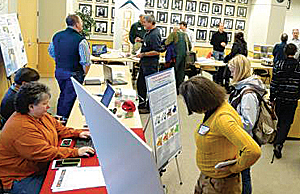 "Our event stimulated interest in geospatial technologies among faculty, staff, students, and the general public," said Tami M. Wells, PhD, biological and health sciences physical and computational sciences adjunct faculty at the University of Pittsburgh at Bradford. "Students also met with administrators of the university to discuss GIS courses and labs they could register for to expand their future career opportunities." GIS is experiencing huge growth all over the world, particularly in Eurasia, where the demand for efficiency and sustainability is paramount as industry steadily grows there. 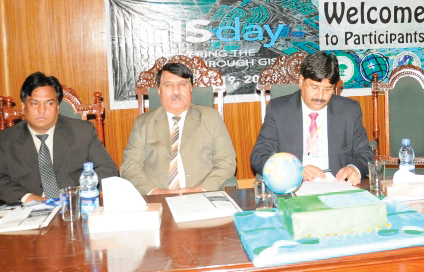 The Pakistan Geography Alumni Association celebrated GIS Day with a two-day seminar to stimulate public interest and encourage new technical talent looking for a promising career. More than 15 organizations and institutes exhibited at the event, offering GIS information and showing how the technology affects the lives of Pakistanis and the world's citizens. "GIS relates to so many aspects of [our] lives that many of us aren't even aware of," said Pir Mehr Ali Shaha, Arid Agriculture University of Rawalpindi. Vice Chancellor Dr. Rai Niaz Ahmad said, "Our GIS event aimed to show how the specific use of GIS in agriculture maintenance not only informs decision making in Pakistan but can actually bring prosperity if applied intelligently." With the United States Department of Labor recently declaring geospatial technology as a burgeoning occupational area, today's youth are more excited than ever to learn about GIS. To guide the geospatially curious onto a promising career path, Esri president Jack Dangermond and David DiBiase, Esri education manager, hosted the GIS Day Open House at Esri's Redlands, California, headquarters. The Open House included user presentations, demonstrations of the ArcGIS platform by Esri staff, and a mentor center booth to give career advice to job seekers. "We wanted to excite attendees about the potential for growth in this industry because there's obviously a huge need for more talent," said DiBiase. "We got more than we expected; before the end of the event, we'd already interviewed 10 candidates who we could easily hire right on the spot."